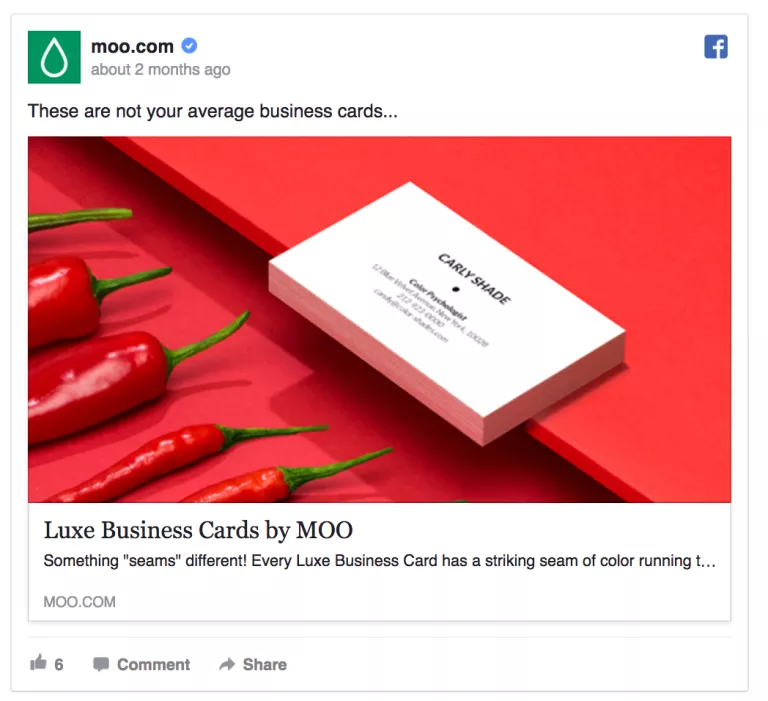 KlientBoost’s Johnathan Dane shares some of the most effective Facebook ads he’s seen—and what we can learn from them for our own campaigns. We all want our digital marketing campaigns to generate the highest ROI possible. This is why so many marketers diversify their campaigns across multiple paid channels like Facebook and other social platforms. But as you scroll down your Facebook news feed, you’ll notice the seemingly endless sea of different brands advertising their content, products, and services to you. Having a sleek website and a cool new product isn’t enough to distinguish your brand from your competitors. Your ads need to grab the ever-shrinking attention span of social media users. One of the best ways to learn a new skill is to see how the best do it. 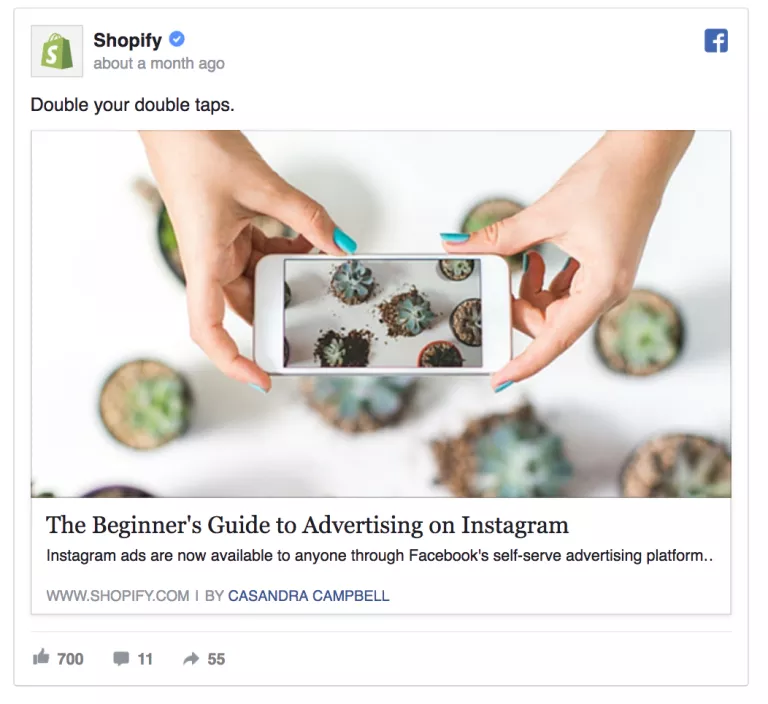 So to make sure your Facebook campaigns are converting at full speed, we at KlientBoost have compiled our 10 favorite Facebook ad designs to show you what rocks on The Social Network. Hopefully, you can take home a few tips and tricks to your own ad designs to start boosting your engagements, clicks, and conversions. So, what makes this specific Facebook GIF ad so awesome? How interactive it is—it encourages users to respond to the ad beyond just clicking a button or purchasing a product. You can engage without leaving the platform. Buffer does a great job in this ad to play to a popular cultural node that users can respond to. Not only that, they’re aligning their own brand with the protagonists of the Harry Potter story. The ad makes Buffer’s ad campaign a playful experience. As you can see, there’s already been quite a bit of engagement with the ad just in likes and other reactions. Regardless of what kind of engagement you’re trying to generate with your ad campaign, creating an experience that encourages interaction and feedback is key when you’re advertising on Facebook. And a static image may not cut it anymore. GIFs can be fairly extensive to develop depending on what you’re trying to animate. When it comes to ad creative, there’s a never-ending debate between photo ad creative and designed or illustrated ad creative. But, the truth is that you can get creative with either one. Regardless of the medium you choose, the success of your ad creative depends on how unique you can make it. Ad creative is called that for a reason—show us your creativity. 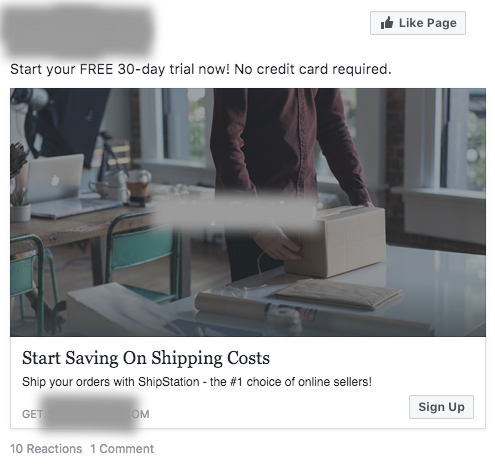 As you can see above, Shopify really went in on the whole “meta” theme for their Facebook ad. And the results are awesome—just look at the engagement at the bottom of the screenshot. You can see that users appreciate the continuity of the ad through the ad copy, headline, and image used to market a very relevant product. Shopify is also doing a great job in this ad of playing off of a very widely known complaint about Instagram-obsessed consumers. People are always snapping pictures of their meals, etc., and nowadays it’s almost become a common practice of taking pictures of their picture taking. 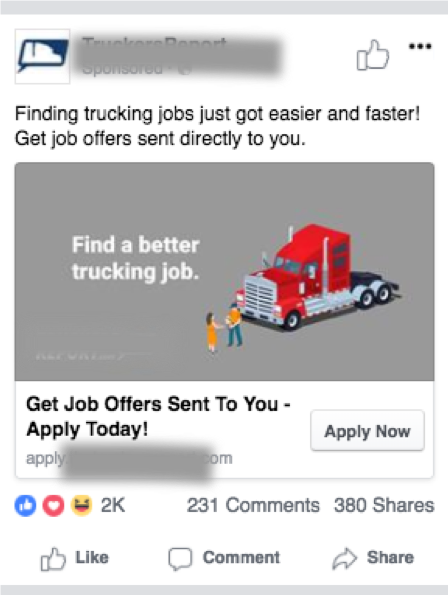 This ad plays directly into that meta-mockery trend and uses the same imagery, matched with parallel copy for one awesome Facebook ad. 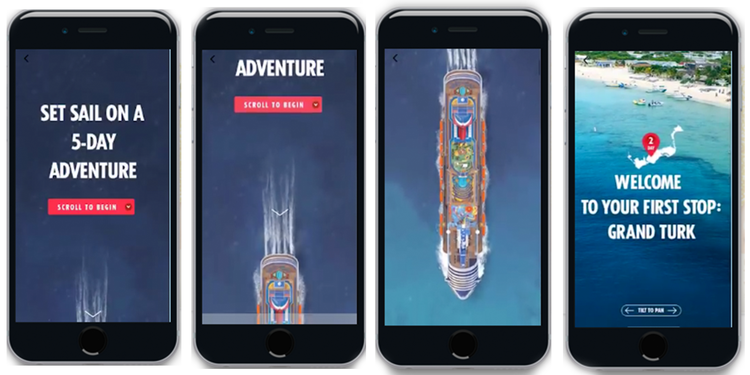 Canvas ads are mobile-first, full-screen ads that allow users to scroll through a particular ad image, video, animation, etc. These ads create a far more immersive experience than ordinary Facebook ad creative. And—if you know how to tell a story around a given product or service —they’re great for creating a cohesive, storytelling mood. That’s exactly what Volkswagen decided to do with their canvas ad. VW went with an aerial shot of their new car model driving on a winding mountain road. The user helps navigate the car throughout the mountainous terrain. It’s a delightful ad that does a great job of explaining new features that make the car unique. And the unique aerial design is sure to stick in the minds of any viewers, making it a solid potential seed for remarketing campaigns later on down the road. Lastly, this interactive experience helps gamify the advertising and conversion experience, both of which should help boost the overall success of the campaign. So far, all the examples we’ve shared are on the elaborate side. 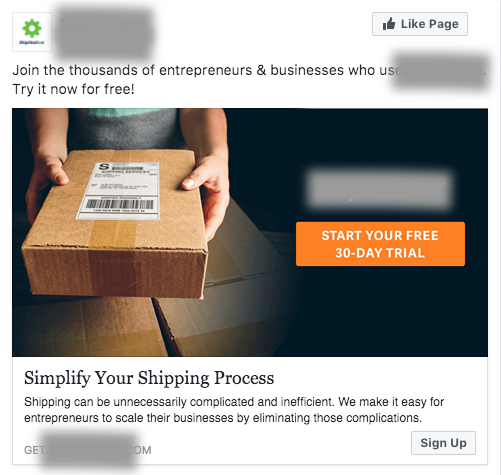 But with Facebook ad design, simplicity can be effective as well. Especially with autoplay becoming more and more of a nuisance to online users, complex ads creeping into social media can be overwhelming. In this case, a clean, static, and delightful image ad can make all the difference. This is one reason why we found Moo’s red-hot image ad so, well, red hot. In the screenshot below, you can see that Moo started off with some strong, attention grabbing colors for their ad. Using high quality photography to stage your ad creative is also a best practice they follow. But they don’t stop there. They even added to the mood they create with the red background by placing chilis in the foreground pointing to the product. Even though it’s as simple as Facebook ads come, this one is a powerful example of just how creative you can get. Photo-based ads aren’t reserved for product-oriented campaigns. You can get quite scenic with your ad creative. And regardless of what service you’re selling, if you can market it as an authentically unique experience, you may see some huge wins with modern customers. In fact, a whopping 98% of consumers surveyed said they were more likely to buy after a positive “experiential” marketing experience. Modern day, post-digital consumers are shopping for experiences more than they are products or deals. And scenic photography is a smart way to market these experiences to potential customers. This is what United did with their FOMO photo campaign. Their headline and ad copy focus heavily on creating life-long experiences. Travel has always been heavily marketed through experience-driven copy and creative. This ad is deep in that mainstream line of advertising. However, what this Facebook ad does with the two models in the foreground is special. Especially while scrolling through our news feeds, we face a great deal of FOMO in regards to what our friends and colleagues might be doing—where they may be traveling and the experiences they’re crafting together. 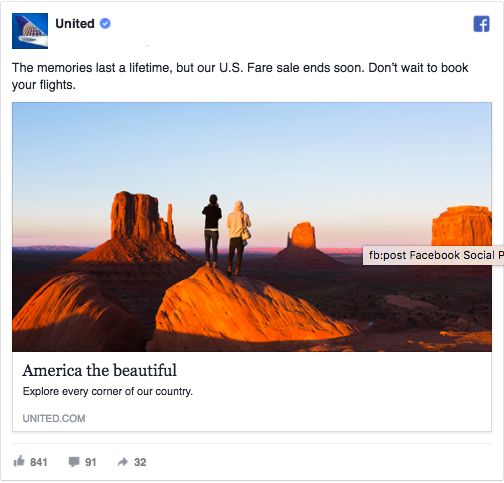 United’s ad plays off these insecurities while drawing the user’s attention towards a beautiful desert landscape. It’s not only a memorable ad, but an emotionally evocative one. And, as you can see from the bottom of the screenshot, they saw plenty of results from it. It’s also important to note that they use some unifying copy at the bottom of the screenshot. Connecting on some common ground is always one of the best ways to convince a reader of converting. Never underestimate the power of a shared history. Find ways to connect with your customers. Each type of ad on the Facebook business platform has its own goals. Some focus on generating likes and followers for your page, and others work to generate link clicks and actual conversions like downloads and registrations. These are only a few best practices to follow. But the list goes on, if you want to read more. Then, in the actual headline and copy, they address the issue further. Keep your user focused on what matters to you by keeping your ad focused on what matters to them. Facebook is, first and foremost, a social media platform. So using it as a channel to both generate and promote social proof makes logical sense. Why is this ad so effective? Because of Bokksu’s combined use of social proof with brand strength. In terms of ad copy and headlines, there’s next to nothing in this ad that’s actually developed by an advertising/marketing expert. Yep, all the ad copy and headlines are products of reviews. The entirety of the copy is customer testimonial and the headline itself is a review. Even the star rating is integrated from a third-party review site. The only part of the ad that is actually brand-crafted is the ad creative. 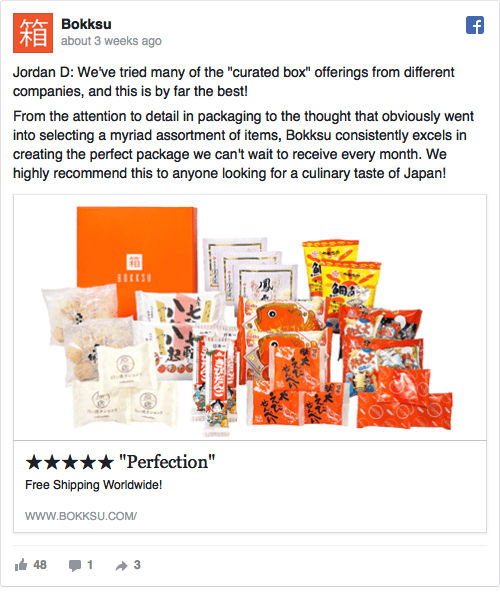 What did Bokksu do to best leverage their social proof promotion? They made their ad creative heavily focused on their own brand colors and design codes. This is a great way to combine the rave reviews on their ad with their brand—without coming off as explicitly self-promotional (beyond the obvious fact that they’re literally promoting themselves). Having a cohesive brand code that unifies your website with any social ad campaigns you may be running can help streamline your user experience and make conversion easier as users jump from Facebook to your actual website. But what makes a great remarketing campaign? Well, without getting into technical remarketing tactics and staying focused on ad design, the best ads focus on re-stressing the value of converting to users more than the product itself. As opposed to continuing to advertise the features of your product, remarketing is where you can double-down on the time-saving, cost-cutting, or hassle-eliminating value of your product. Plus, the image used is far less intense than the original prospecting ad the same brand used in example #6 above. Why? Because remarketing is a more subtle art that requires a softer touch. A clean photo is a must, but a direct and ham-fisted CTA isn’t always necessary. From photo to video, from GIF to canvas, we’ve covered quite a few different types of Facebook ads. Why not discuss a classic designed image ad? Design ads can give you a bit more control over your imagery than classic photo ads. After all, you’re creating 100% of the creative here as opposed to manipulating the model and or product around to try and get the best result. The above example generated some serious engagement on Facebook. Our news feeds are constantly being flooded by different live-action videos on autoplay and Instagram worthy, photo-based content. When people are constantly bombarded by these types of ads, a clean digital design can really stand out. I know it might seem contradictory to statements I make about being unique—so take a good look at what your competition is doing, specifically, and maybe try the opposite. It’s just another way of standing out by, well, not standing out. That’s the key to marketing success: Be delightfully different. It’s not about hopping on the most popular channel and copying the most popular tactic—it’s about finding which tactic and channel best highlight your brand as unique and authentic. 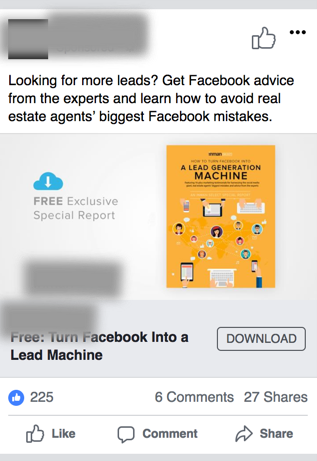 I’ve already mentioned that each type of Facebook ad campaign holds with its own unique goals. Some focus on engagement while others focus on generating leads or sales. Lead-gen campaigns like the example below focus on generating actual downloads of the brand’s gated asset in order to fill their pipeline with qualified leads for their sales team to directly address later. This is pretty much another basic image ad, but it uses a different CTA button that emphasizes the take-home value of converting. For such a direct lead gen campaign, having your gated content visible in the ad creative is a must. You want people to know what exactly they’re taking away from the conversion. This brand also makes sure to emphasize that the download is free and it’s an “exclusive” offer that people won’t always have access to. Remember that, above all else, your Facebook ad’s success isn’t going to depend on which popular trend you follow. The success of your social campaigns will come from how delightfully different you can be. The more unique and authentic you can make your brand, the more successful you’ll be.